Welcome to another side of my world: antique cars and racing. I grew up with a mechanic for a father and I admire the man's knowledge of these crazy machines. He built quite a few scary running cars and helped me understand a bit of engineering along the line. I absolutely adore the sound of a well tuned race or modified street engine. To me, they are a symphony as anyone who loves these beasts will tell you. A car that is put together well sounds like music and they look like art. One of my earliest painted, wooden cutouts was this very car. I drew out the image and painted it up after I cut the piece out on a bandsaw. I gave it to my dad and it is still on the wall of his garage collecting dust and marking a spot in family history. I may do more projects like that, but in the meantime I am doing digital art when I am not painting glass. This car and the story behind the man behind it won me my first writing award on a site called Squidoo. I actually won my dad a hoodie, but they didn't have one large enough. What it won me was a spot of honor on the Father's Day featured page and the story is The Mechanic and the Red Head. It is now found on Hubpages. The 1932 was originally known as the Model B when it was released. The car quickly became a popular style then and although it is a rare item in the collector world its popularity is still very strong. Most of the antique restorations may be fiberglass bodies. You can order one through automotive catalogs that specialize in remakes of classic cars. 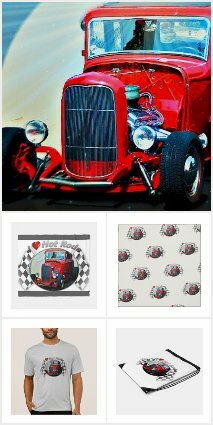 The hot rod world reveres this classic look and it has been featured in everything from album covers to popular movies. The gleeful welcome this car gets when it arrives on scene tells you it is something special. 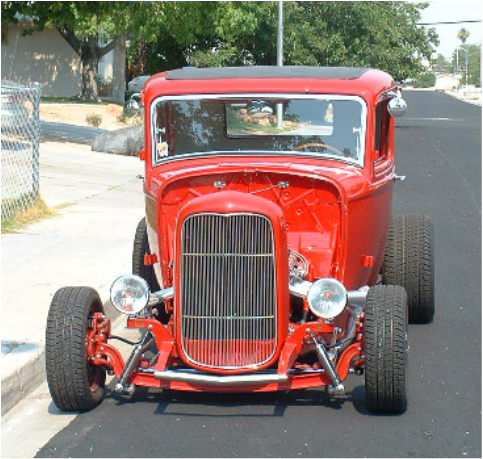 The hoots and hollers it gets running down the street is a moment of pride for the mechanic that built it.